As millions of people know, one of the toughest things about completing the Whole30 is figuring out what to eat next, the other 335 days of the year. Teri Turner, creator of No Crumbs Left, has healthful and great tasting answers. Food is Teri’s love language, and her approach to getting people into the kitchen, rolling up their sleeves, and cooking is contagious. “Don’t be afraid to fail: it’s just food,” is one of her mantras. Teri’s passion is evident on every page of her first cookbook, as she leads readers through a discovery of new flavors and spice combinations and teaches people to trust their cooking instincts. 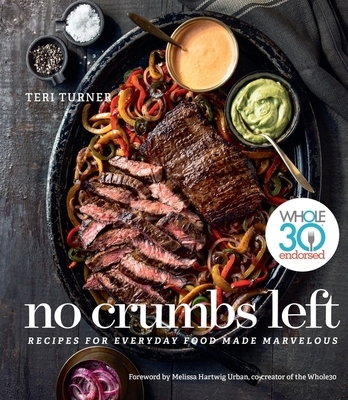 Teri’s recipes, most of which are gluten-free, grain-free, dairy-free, and Whole30 compliant, are what makes No Crumbs Left so unique. Simple and incredibly delicious dishes such as Pistachio Pesto Chicken Breast, Shrimp Pad Thai, and Spicy Pepperoncini Beef are on the dinner table quickly. The impossibly easy Sugar Snap Pea Salad features two of Teri’s signature Magic Elixirs, Green Goddess Dressing and Smoky Pepitas, which are both made in advance and kept on hand to elevate countless meals. Her signature Marinated Red Onions, 999 Island Dressing, Gomasio, and Spicy Almond Sauce are true secret weapons. The Family chapter features the special recipes her own children grew up with and evoke home, love, and motherhood. Teri considers this book a love letter to her mother, and woven throughout are tips and favorite quotes to bring you right into her kitchen, where there is always an extra seat at the table. TERI TURNER is the creator of the popular food and lifestyle blog No Crumbs Left. Formerly an event producer, she has always been committed to bringing magic into the kitchen when cooking for her family and friends. As a brand innovator, influencer, and trendsetter, Teri provides fresh ideas for her fans and clients. Her Whole30 takeovers and global meet-ups celebrating her foodie adventures and life experiences, as well as her weekly podcast, Table Talks, featuring Teri one-on-one with a guest, captivate her followers. The mother of two grown children, Patrick and Lucy, she considers motherhood her most valuable role. A native Chicagoan, Teri shares her life with her partner Roy, dividing their time between Chicago and Northern California. If you have any questions about the availability of a book listed on the website, please refer to these Inventory Status Descriptions or call us at 504.895.2266.